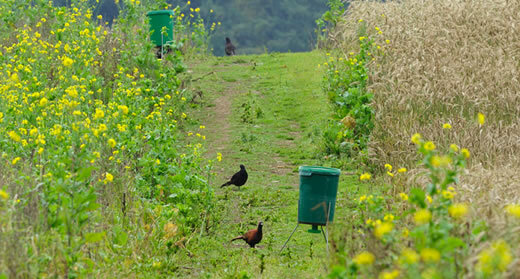 The role shoots can play in protecting wildlife in our countryside has been warmly endorsed the RSPB. Their position points out that shoots can “provide beneficial habitat management for wildlife”, including woodland sky-lighting, planting cover crops and creating conservation headlands. This conservation potential is significant because land managed for game is ten times that of our nature reserves. The press have picked up on the RSPB’s evidence led approach which cites Game & Wildlife Conservation Trust (GWCT) research on pheasants published in 2005 and our figures showing that shoots create or maintain 7,000 hectares of hedgerows and 100,000 hectares of copses. This published GWCT science is not new - but recognising the evidence that links shooting and conservation remains controversial for some. The RSPB say their support for shooting has caused “a bit of a hullabaloo”. It is easy to see why. Conservation is often presented in a way that panders to people’s preconceptions - the true definition of dumbing down. The RSPB point out that people can’t make “simplistic interpretations” yet it is easy to see why. Time and again in magazines, on radio, but especially on television, the GWCT encounter journalists who are eager to visit country estates to make enchanting natural history films about wildlife and then carefully air-brush out the gamekeeper and the fact that it was his hard work that made the film possible in the first place. Are we too quick to dumb down conservation? A Natural England report on the results of its farmland conservation schemes in 2009 championed the Norfolk Estate in West Sussex. 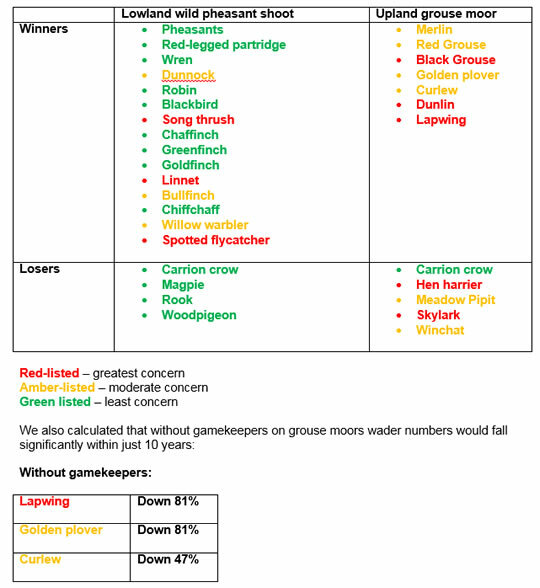 It reported that “grey partridge numbers have increased by over 250% per year, corn buntings over 100% per year and skylarks 71% per year” yet it failed to mention that this was a shooting estate - the very hard work undertaken by gamekeepers was not even mentioned; nor the motivation to achieve these remarkable results. For a number of years the RSPB ran a farming award. Each year the winner was a GWCT member that achieved amazing results, in part, motivated by running a shoot on his farm.This important link with shooting was also air-brushed out. With so many journalists, civil servants and conservationists pandering to peoples preconceptions it is no wonder that the RSPB have caused “a bit of a hullabaloo”. A new approach to conservation is required. The 2013 State of Nature report highlighted that 60% of recorded species were in decline – but the lack of solutions makes the report terrifying reading. Over the last few decades conservation thinking has focused on protection and prescription by those with clip boards working in offices. It has not worked well enough. New approaches will be required that tap into motivation, such as shooting, and making the most of the money and commitment that is available. The financial investment in shooting makes a huge contribution to nature conservation in the UK – and could do more. This money has so far protected and plants, woods and birds over a colossal area - from lowland farms and woods to upland grouse moors. The best areas for upland waders in mainland Britain is on grouse moors. On any criterion, grouse shooting provides a highly sustainable form of land use – not just a GWCT view but the high conservation value is why the RSPB continues to invest in a driven grouse moor at Langholm. By contrast we might question the lack of managing on upland areas that are not grouse moors. In some of the National Parks, where emphasis is placed on outdoor recreation, it may be at the expense of nature conservation. In the spring grouse moors are alive with peeping waders and displaying grouse, birds that are disappearing fast from the rest of the country. It won’t be easy to change conservation thinking – but change is overdue. Change is never easy or smooth but that is no reason for not trying. Too often we see the public being given the impression that abundant wildlife comes about because it is protected from man and not the result of hard work. Shooting, like farming, has its share of challenges – but these are best resolved by engaging positively with those on the ground. Shoots across the county will be delighted the RSPB are taking the same approach. How do we judge these winners and losers? Clearly, it is too simplistic to just tally them up. We need to judge them against a background of their abundance elsewhere and whether or not they are declining nationally. If we make this comparison, some birds stand out. For example, willow warbler, spotted flycatcher, linnet and bullfinch are declining nationally but increased on the GWCT wild pheasant shoot at the Allerton Project farm. On grouse moors, red grouse, black grouse, lapwing and curlew, are faring better than elsewhere but are in national decline. Meadow pipit and skylark fare less well on grouse moors, probably because the vegetation is dominated by heather rather than grass. Similarly heather burning for grouse eliminates the taller shrub like gorse, pioneer birch and pine, and therefore whinchat are less common on grouse moors. We believe, with carefully planned management, hen harriers can thrive on areas managed for grouse. I think there would be even greater support for this type of management were it not for the fact that tens of millions of captive bred pheasants (and partridges) are released each year. I do not see a lot of difference morally, than trap shooting pigeons, a once Olympic sport outlawed in the 1920s. So difficult to understand RSPB's position. Talking of morals I suggest the freedom and quality of life experienced by pheasants and partridges is infinitely preferable to that of the 800 odd million chickens we Brits consume each year that exist for about six weeks before a certain and ignominious death. I suggest that your piece does GWCT a disservice. I know it is the time for soundbites, half-truths and headlines that bear little relation to reality but I think your headline and article would do any politician proud. The RSPB made clear its position on shooting – it is neither anti nor pro and remains neutral on the ethics of shooting. To suggest otherwise, as your headline does, is disingenuous at the least. And as the RSPB seems to draw criticism from both the pro and anti shooting lobbies, its actions seem to support its clearly stated position. The hullabaloo is created by both these sides, not least the recent attempts by the Countryside Alliance and the notorious You Forgot the Birds nonsense to discredit the RSPB. Strangely, the outcome of their challenges did not make the headlines. There is no doubt that land managed for shooting can have beneficial conservation effects – that is what the RSPB recognises and encourages and supports in working with many landowners and farmers. But that is only half the story as the RSPB and other conservation organisations also identify the negative environmental impacts associated with high-density game bird production, particularly the effects of the annual release of millions of grey partridge and pheasants and the absence of birds of prey from many of our uplands managed for shooting. Even the GWCT pheasant research that you quote as the source of RSPB “support” reports on the negative impacts of pheasant release pens on woodland environments. And then there is the line about the scale of conservation benefits brought about by management of land for shooting but with no mention of the public subsidy that goes hand in hand with this in lowland and upland areas. The taxpayer, as well as the gamekeeper, should be given some credit. A more balanced and credible article would reflect the RSPB’s true position, rightly trumpet the conservation benefits of managing land for shooting, but also highlight where more works needs to be done to achieve a sustainable balance between shooting objectives and genuine bio-diversity. In good habitat, I don’t think we need any more research that shows how waders and gamebirds will do better if all their predators are removed. How about some research that properly examines the dynamics between predator and prey populations and the range of environmental impacts caused by intensive management of land to produce unnaturally high numbers of gamebirds. That would really put the Wildlife into the Game Conservation Trust. Come and join the RSPB in the middle ground.